Jazz and swing wedding band and event band for hire in South Wales | The Hipcats - jazz and swing band for weddings, corporate functions and other events in Chepstow, Newport, Cardiff, Swansea and across South Wales. THE Top Jazz and Swing Band in South Wales! Covering Cardiff, Swansea, Newport, Chepstow and South Wales. The perfect jazz and swing band for weddings, parties, corporate functions and other events in South Wales. As seen at Cardiff Castle, Celtic Manor, Chepstow Music Festival and many other top events. Click the cat for a world of swinging grooviness! The Hipcats live jazz band for wedding, parties, corporate functions and other events. Great wedding band for your special day, perfect party band, brilliant function band and just the right thing if you are looking for a jazz singer or jazz band for a tribute to Frank Sinatra, Dean Martin, Michael Buble or any of the great swing singers. For all events in Chepstow, Newport, Cardiff, Swansea and across South Wales. 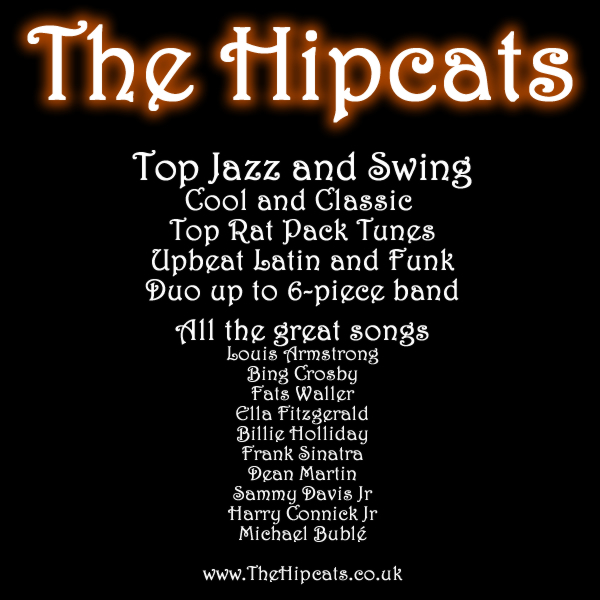 The Hipcats - the UK's finest jazz and swing band - covering the south, the south-west, the midlands, Birmingham, Bristol and Cardiff.